The Living Building Challenge is less popular/spoken about than certifications such as LEED and WELL. Perhaps this is because the Living Building Challenge is more involved, and difficult to achieve. The challenge also requires twelve consecutive months of building operation before it can receive certification. LBC has a lofty mission: to “make the world a better place,” and it aims to do so in a manner that is elegant and thoughtful. But isn’t this the motivation for most architects and designers? We should strive to make a place better than we found it, whether it be an interiors office renovation or an urban design project that uplifts a city community. 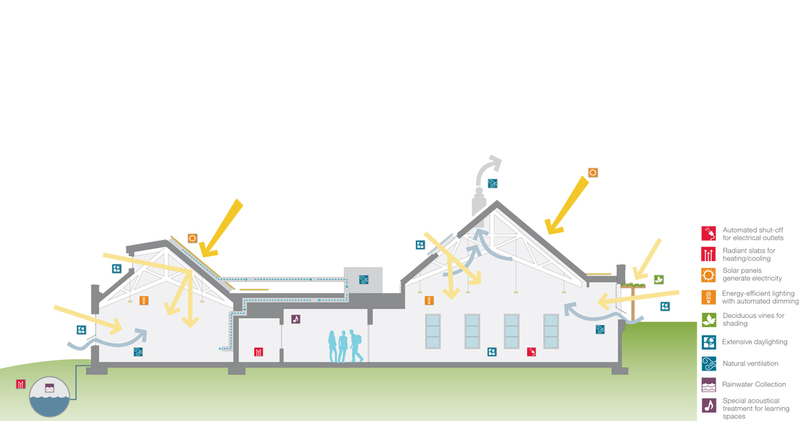 The design of Hood River’s new Music and Science building not only achieves Net Zero Energy standards, but also teaches incoming generations about the importance of sustainability and serves as a connection to the environment. 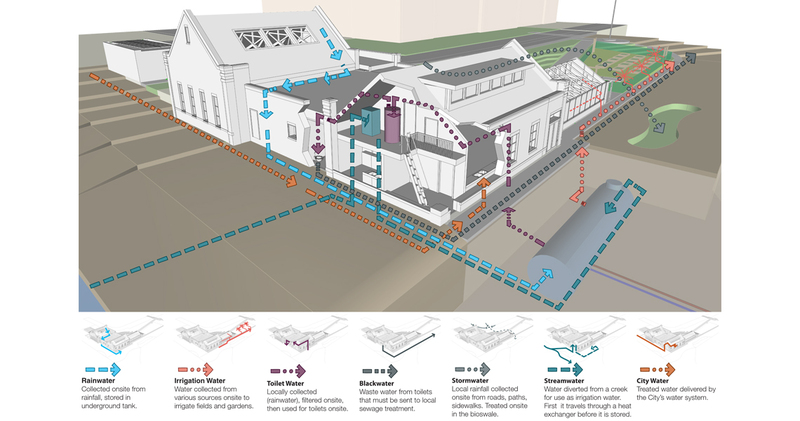 An important strategy for the design of this project was to consider Net Zero on the front end of design development. Rather than relying solely on applied photovoltaic panels and renewable sources of energy, the team first developed passive systems and optimized the site’s natural resources. Aside from the extensive work that was done to achieve Net Zero, the project also integrated the design principles of Permaculture. Permaculture, a concept developed by David Holmgren in his book Permaculture: Principles and Pathways Beyond Sustainability, is a whole-system approach that aims to change human behavior the ultimately use less energy and resources. By involving the students in building the school’s community garden and rainwater irrigation systems, the school is able to develop an early connection to nature and an understanding of sustainable living. The place petal, and human-nature connection are both achieved through hands-on outdoor learning. Not only is this approach beneficial for the environment, it also has incredible benefits for student health and learning.